In the late 90’s the country was swept up in a toy buying craze. Not Star Wars Action Figures, but people were nuts over Beanie Babies. Their collectors were rabid and voracious. To get in on this fad, Kenner brought Star Wars Buddies to the toy aisles. Small cute plush versions of some of the fan’s favorite characters. 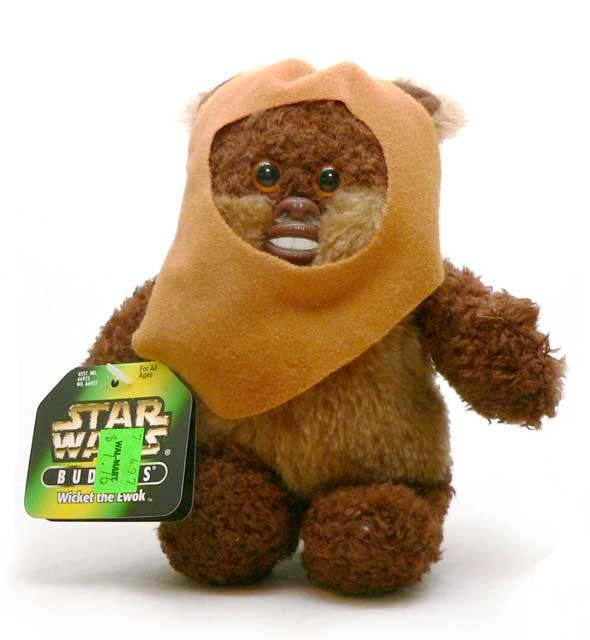 Of course, Ewoks and plush are made for one another. And the main cute Ewok is Wicket. So, he seems like a natural choice for a plush figure. They actually did a pretty good job of translating the growling on-screen furball to a plush character. I really like the fact that they went with a movie version of him here. The animated stuff was cute, but this really is the Wicket folks remember. For a plush, the most important part is going to be the face. I think Kenner really nailed that here. 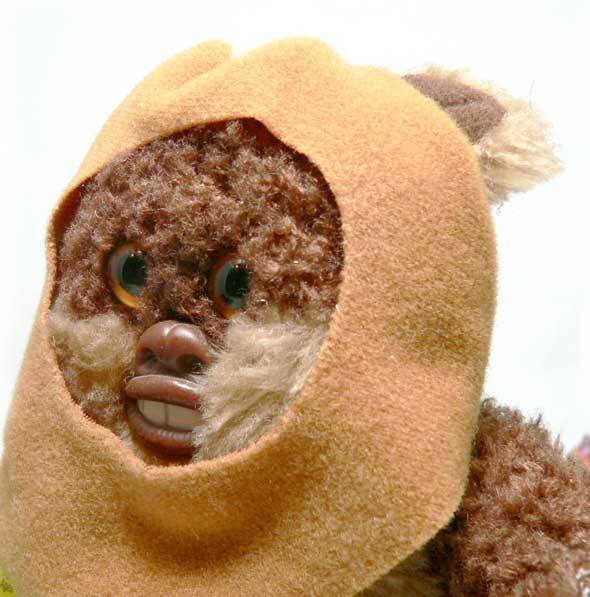 With the help of a molded nose and mouth, the face really has the Ewok down. The lips and over size teeth really sell this little guy. The other thing that helps make this Wicket is the hood. This loose piece of felt on the front let them gave Kenner the chance to make his face 2 tone. While the screen version had cheeks and eye fur the same color, here it gives him a chubby cheeked look. I suspect the cheeks may have been teased out a bit after the hood was put on. The back of the hood is sewn down as part of his head so little hands won’t pull his hood off and loose it. The fur they picked does a pretty good job of portraying the matted look of a real Ewok. It’s not the typical smooth fur you’d find on a teddy bear. The dark brown is a bit clumpy and the tan looks good. My one problem is that the fur on mine is missing in spots. What I don’t know is if this was loose fur that just fell off, or has deteriorated. I’m guessing deteriorated. They’re not big areas, but something to be aware of if you are in the market for one of these guys. 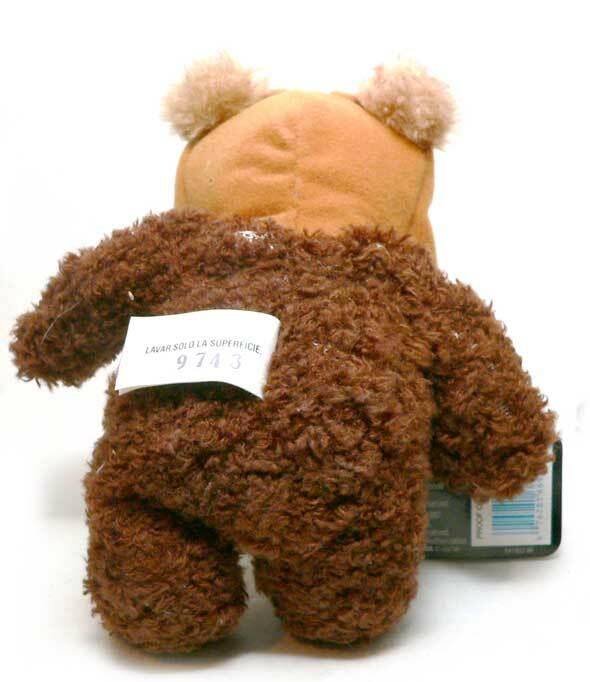 A search online shows that you can still get some of these furry fellows. Based on the 1997 Wal-Mart price sticker on the hang tag, it appears my investment has gained anything. I’m a bit surprised that I paid $7.76 for one of thse guys. As an impulse buy, that seems a bit much. It also is probably the reason this line didn’t make it past Episode 1. For a cute cuddly version of an Ewok, you can’t really go wrong with this Wicket. He’s recognizable as the character and well crafted. I have to say I like him a bit better than his Mighty Mugg counterpart. I’m sure I had Jabba but he wasn’t with the others. I may have used him in a display until a suitable palace one was available.